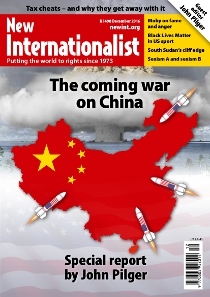 The coming war on China: A major US military build-up – including nuclear weapons – is underway in Asia and the Pacific with the purpose of confronting China. This is provocative and dangerous, argues John Pilger in his special report. Tax avoidance: An in-depth and global look at how corporations and rich individuals are looting the public purse – and why governments are allowing them to get away with it. Edited by Josh Eisen and Richard Swift.